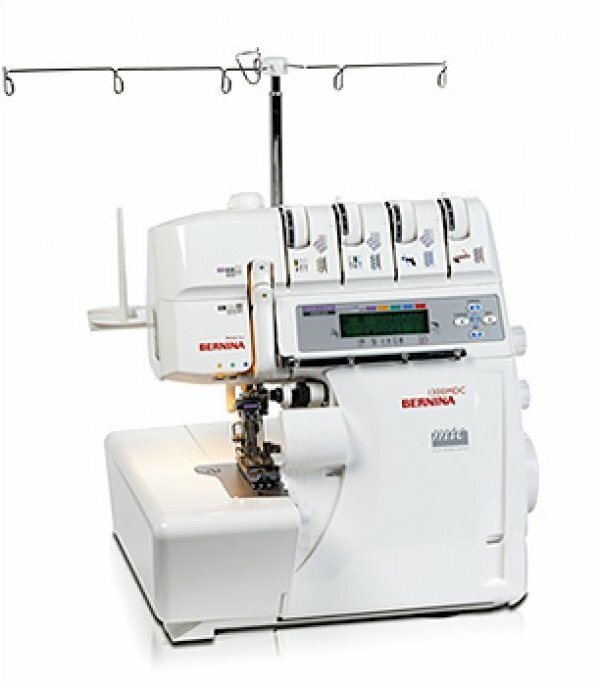 The Bernina lay-in system lets you thread quickly and directly—and the automatic lower-looper threading system makes it simpler, too. Stitch widths up to 9 mm. Even lets you sew together loose knits, such as hand-knitted sweaters. Sew, cut and neaten in a single operation—in overlock, chain or coverstitch. Innovative features make Bernina sergers delightfully easy to use and ensure professional quality down to the last stitch. by the wide range of stitches and enjoy the wealth of deluxe features that make serging an even greater pleasure. From loose to lovely with a flick of the wrist. Micro Thread Control (mtc). Only from Bernina. Micro Thread Control fine tunes over-edge thread length at the turn of a knob for tight, clean results like this. The M series – two amazing sergers with the exclusive and patented* micro thread control. from loose to lovely with a flick of the wrist. It’s not just more precise, it’s easier. Previously, to correct overhanging thread loops, you had to reset cutting width and both looper tensions. Now, one twist of the mtc knob makes a smooth, tight seam, and makes it easy to create a professional finish as you move from fabric to fabric. These edges are so perfect, you have to see them to believe them. Durable, flat stitch for hems and seams in elastic materials. Use for flat seams, finishes with sandwiched or sewn-on elastic, and elastic binding. For the decorative topstitching of seams or elastic straps; may also be used with decorative thread in the looper (wrong-seam-side up). Having limited stretch, the chainstitch is ideal for fairly firm-woven fabrics, stabilizing seams, and bindings, as well as decorative effects in finer fabrics for garments and home textiles. May also be used for decorative seams with decorative thread in the looper (wrong-seam-side up). The two different parallel seams and the limited elasticity of the chainstitch make this extremely hard-wearing seam ideally suited for firm-woven fabrics such as jeans, uniforms, jackets, and more. A highly elastic seam in lengthways- and crossways-stretch fabrics such as Lycra and cotton-Lycra.